Attempts to repeal a ban on openly gay men and women serving in the US military received a serious setback on Thursday when a key vote failed. The senate voted 57-40 to block debate, thus preventing a vote on the issue itself. Democrats needed 60 votes to overcome Republican delaying tactics. The vote may signal the end of months of debate on one of President Obama's policy priorities, analysts say. Mr Obama said he was "extremely disappointed" by the vote. "I urge the Senate to revisit these important issues during the lame duck session," the president said, referring to the time between November's congressional elections and the January start of the new Congress. The repeal bid which failed on Thursday was attached to a spending bill that funds the activities of the Department of Defence. Senator Joe Lieberman has said he will attempt to bring the repeal to the floor as a stand-alone bill. But it is unclear if Mr Lieberman will successfully bring that bill to the floor before the end of the current US Congress. Next year, several Democratic senators will be replaced by conservative Republicans, making it more difficult for a repeal to pass. The BBC's Katie Connolly, in Washington, says that Thursday's vote was less about the policy of gays in the military than a warning to Democrats to not try to move any legislation before dealing with tax cuts. The failure is still a blow to Mr Obama and will add to his increasingly tense relationship with liberals in his party, who were upset earlier this week when he announced a tax deal with Republicans, our correspondent says. Gay voters were strong supporters of Mr Obama during the 2008 election and will be deeply disappointed that one of their critical priorities has been defeated, our correspondent adds. 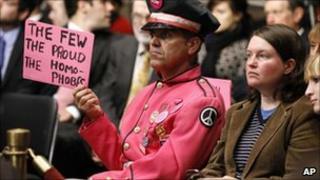 A Gallup poll released today shows that 67% of Americans favour repealing the ban on gays in the military. In Thursday's vote, newly-elected Democratic Senator Joe Manchin sided with Republicans, and Democrats attracted just one Republicans, Susan Collins of Maine, to their side. Ms Collins blamed Senator Majority Leader Harry Reid for the bill's failure, questioning why he brought it to a vote when Republicans had vowed not to pass any bills until the Congress had voted on the extension of the Bush-era tax cuts.